Jumeirah Beach Residence (JBR) is a popular urban destination in Dubai. It is 1.7 kilometers long with 2 square kilometers gross floor area waterfront community located in the heart of Dubai's most popular promenade "The Walk" and the relatively new beachfront low-rise leisure "The Beach". Well positioned against the turquoise waters of the Persian Gulf, JBR overlooks the world’s largest, Ferris Wheel, The Dubai Eye, and is within close proximity to Dubai Marina. It includes a mixed-use development offering residential units, hotels, restaurants, shops and entertainment facilities. JBR is considered to be Dubai's most dynamic and lively seaside district; its hotels offer some of the most unique picturesque views of the tranquil Persian Gulf. Nestled along Jumeirah Beach Residence’ lies an intimate beachfront low-rise retreat with Mediterranean facade, a sweeping driveway, rose petal-strewn fountains and stunning Mashrabiya woodcarvings that provide a dazzling vision of tradition enveloped in an elegant modern setting. 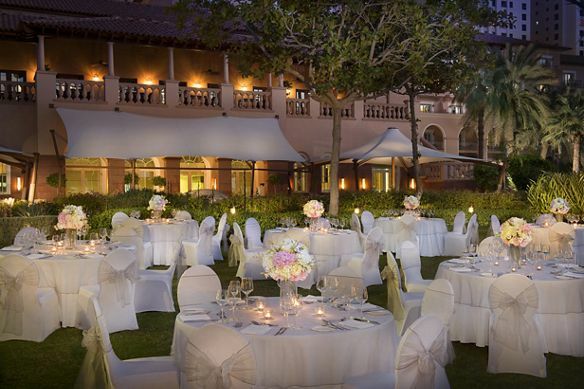 The Ritz Carlton Dubai provides a choice of breathtaking indoor and outdoor wedding venues. 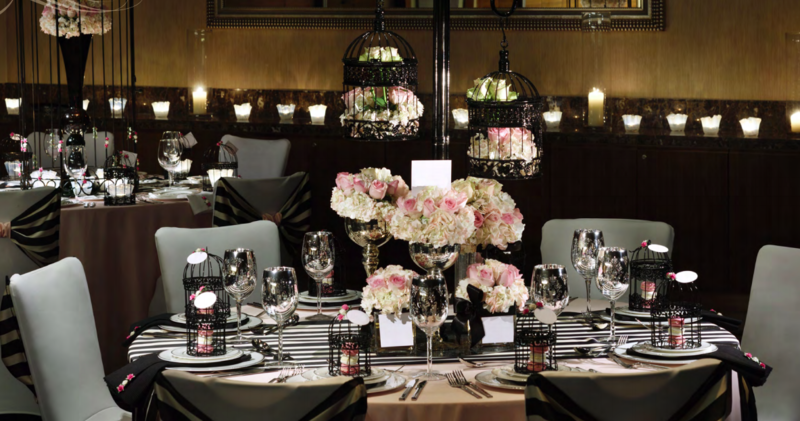 Indoor celebrations take place among the timeless charm and sophistication of the newly designed Loulou’A Ballroom. 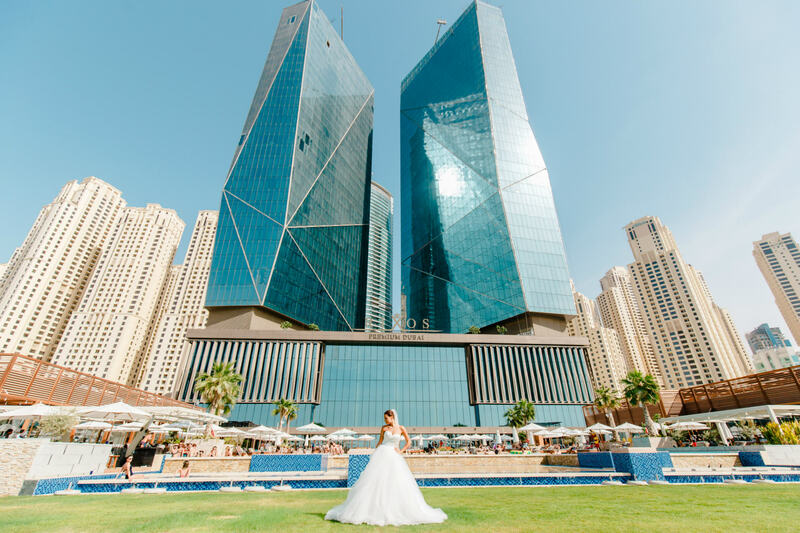 Whilst a choice of outdoor venues set among the resort’s lush landscaped gardens, with views of the Persian Gulf and the sandy shores of the Arabian Gulf, The Ritz Carlton Dubai provides an idyllic backdrop for outdoor weddings. Loulou’A Ballroom: The newly designed grand ballroom radiates with hues of purple and gold, dazzling chandeliers, pearl designs and discreet arcs, providing a distinctly Arabian feel. At 800 square meters, Loulou’A can accommodate up to 550 wedding guests for an exquisite banquet or 800 guests for a standing reception. The Majlis: A magnificent majlis, located adjacent to the ballroom, provides the perfect venue for discreet pre-wedding gatherings or matrimonial meetings, and a warm Arabian-style welcome area for guests. Gulf Lawn: The Gulf Lawn is set amidst the lush gardens of the resort with breathtaking views of the turquoise waters of the Arabian Gulf, dotted with idyllic gazebos and eye-catching firepots. At 1,700 square meters, it can comfortably host up to 700 guests for an outdoor banquet or 1000 guests for a standing reception, whilst blessing ceremonies can take place on the sandy pathway. 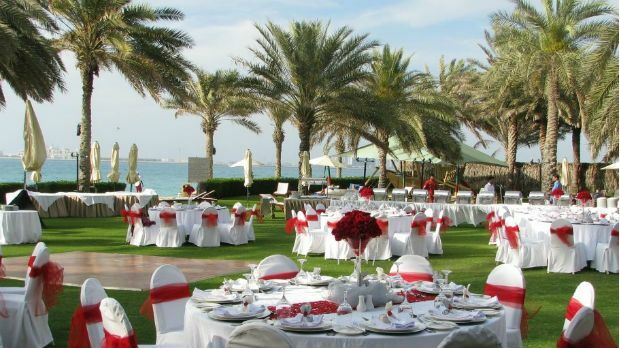 Sunbird Lawn: For a smaller ceremony or reception, the Sunbird Lawn shares the same spectacular views of the Arabian Gulf and provides a wonderfully intimate venue accommodating up to 160 guests. 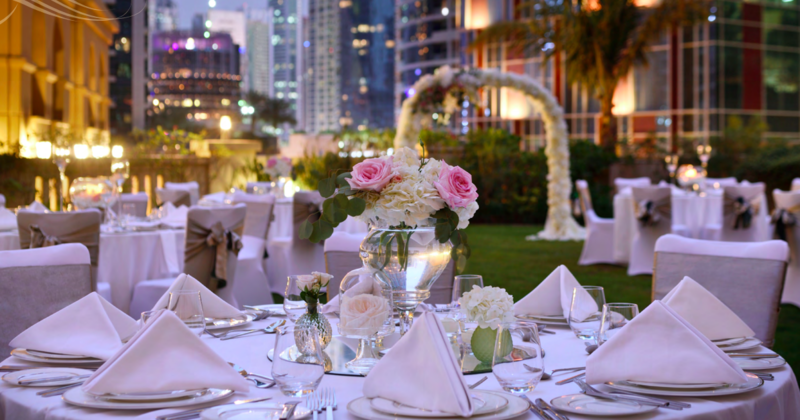 The wedding packages at Ritz Carlton Dubai start from AED 280 per person; they were created by their dedicated wedding team and include buffet and set menu options. Read: Ritz-Carlton Dubai Opens New Indoor and Outdoor Events Spaces. 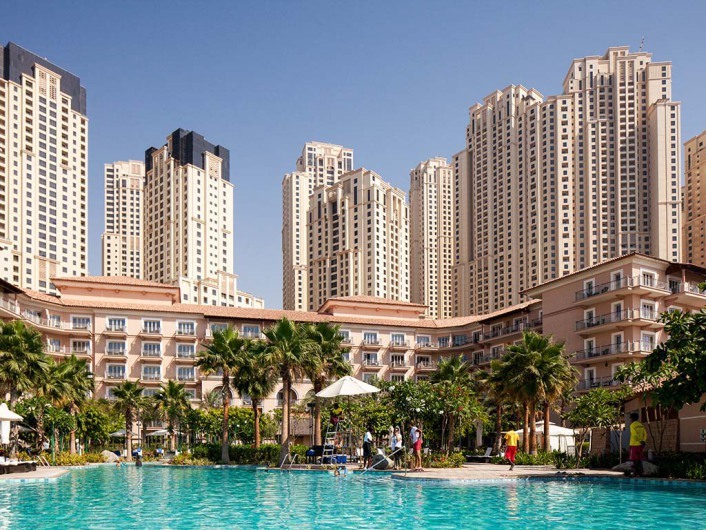 Rixos Premium Dubai is situated at the heart of Dubai’s Jumeirah Beach Residence (JBR). The impeccable crystal design of the 35-storey tower is an architectural landmark transforming the cityscape of JBR. Set out closest to the shoreline, Rixos Premium Dubai features a private beach, as well as, a variety of trendy dining choices. Rixos Premium Dubai opens up new doors of sophisticated banquets and events offering a good choice of spacious venues with seating capacities that goes up to 450 wedding guests in banquet style or 600 guests for a cocktail reception at the Diamond Ballroom. 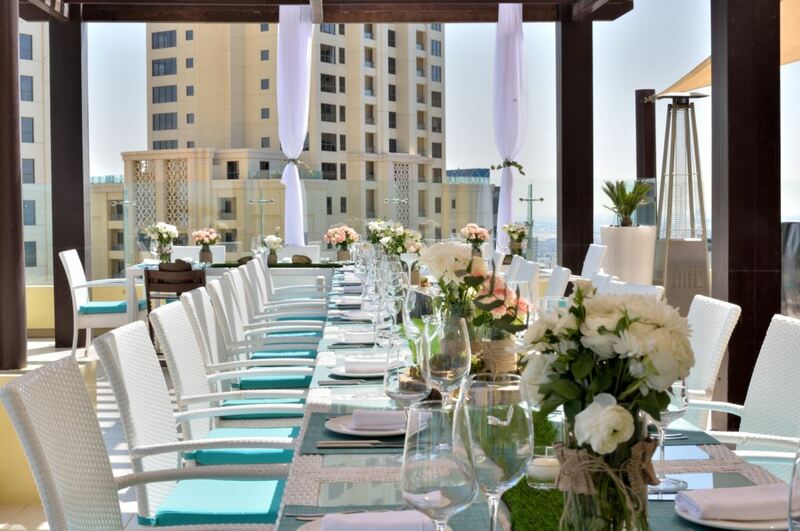 Located on an exclusive beach in Dubai's Jumeriah Beach Residence (JBR), Hilton Dubai Jumeirah offers a selection of venues for weddings. Its ballroom (Almas I, II & III) can accommodate up to 200 wedding guests seated in banquet style or 250 guests for a cocktail reception. The beautifully landscaped and lush gardens accommodate up to 250 guests and provide a great outdoor setting space for an intimate wedding. Hilton Dubai Jumeirah is connected with a bridge to Hilton Dubai The Walk which offers a spectacular rooftop venue called Pure Sky Lounge & Dining. Located on the 35th floor, Pure Sky offers panoramic views of the Arabian Gulf. It is the ideal setting to enjoy twilight dining, specialty cocktails surrounded by stunning 360 degree views of the Arabian Gulf and outdoor weddings. With a large variety of venue options at this 5-star Dubai JBR hotel, guests are spoilt for choice. 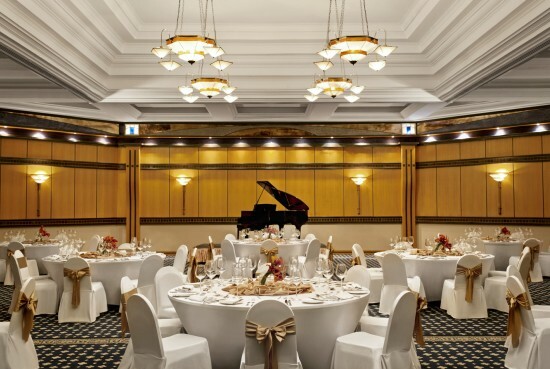 The elegantly styled Melrose Ballroom of the Mövenpick Hotel Jumeirah Beach provides over 500 square meters of space making it the venue of choice for weddings of up to 260 guests in a dinner set-up, allowing space for a stage and a dance floor, and up to 550 guests in cocktail style. Melrose Ballroom can be divided into 3 enclosed areas, if needed, while a spacious pre-function area complements the space beautifully. 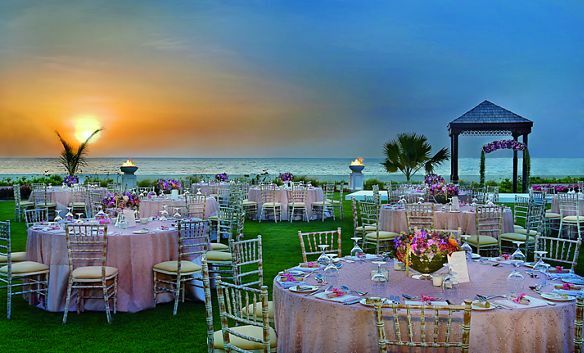 Consider an outdoor wedding with breathtaking, panoramic views of the Arabian Gulf. The outdoor pool and garden can cater for weddings, providing a personalised service which is tailored to specific requirements. Whether you prefer traditional elegance, sophisticated glamour or exclusive intimacy, our expertise and exceptional catering create a truly memorable experience. Wedding packages start at AED 160 per person with a minimum spend of AED 13,000. From an intimate to a big wedding, either in the gardens of the Sheraton Jumeirah Beach Resort or in Al Sufouh Ballroom, you can create the set-up and the theme you always wanted. A five star beach resort combined with the Sheraton service will guarantee your a perfect wedding day. Al Sufouh Ballroom is ideal for weddings offering up to 370 square meters of space where you can host up to 280 guests seated in banquet style. 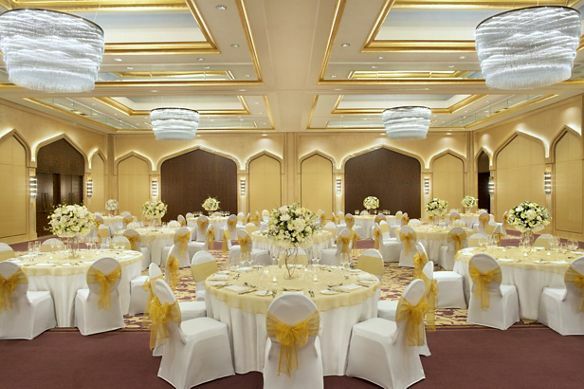 Sheraton Jumeirah is pleased to assist you with all your wedding needs. Their services for both ballroom or beach front outdoor weddings include table and seats arrangements, glassware and silverware, sound system, dance floor and stage with lighting, projector and screen, a selection of buffet menus, free-flowing soft-drinks, juices and water and complimentary 3 kg wedding cake, in addition to a complimentary one night stay for a minimum of 150 wedding guests.